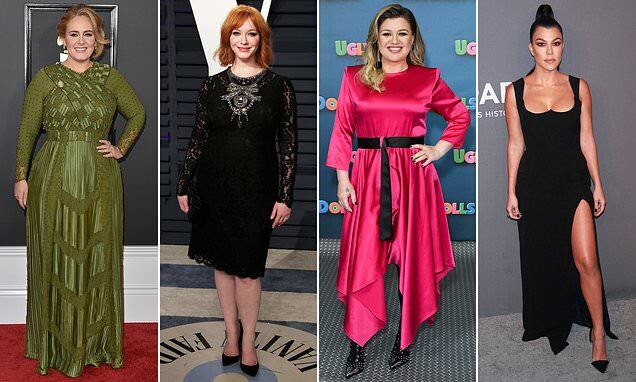 Celebrity fat-shaming may make women more judgemental about people who are overweight. Comments like fashion designer Karl Lagerfeld's claim that singer Adele was a 'little too fat' change people's views, a study suggests. In a study of more than 90,000 people, they found women's knee-jerk anti-fat attitudes increased after a high-profile fat-shaming event. Recent examples have included a blogger saying Oscar-winning actress Jennifer Lawrence no longer looked 'hungry enough' to star in film The Hunger Games. A fashion critic said of Mad Men star Christina Hendricks that 'You don't put a big girl in a big dress'. And 'shock jock' DJ Howard Stern called Lena Dunham, star and writer of Girls, a 'little fat chick'. In the fortnight after these comments, and others like them, women had more negative attitudes towards fat people, scientists found. This was judged in an online experiment which asked them to categorise silhouettes of body sizes and negative or positive words. Amanda Ravary, lead author of the study from McGill University in Canada, said: 'It is hard to escape these kinds of fat-shaming messages, and our research suggests these messages that "fat is bad" do not just affect the celebrity target, but can also influence other women who hear about the comments. 'But still we hear these things and often do not bat an eyelash. The Canadian researchers searched for articles on fat-shaming from magazines, newspapers and internet blogs between 2004 and 2015. These included coverage of singer Kelly Clarkson being told by a television anchor to 'stay off the deep dish pizza'.